October 2010 – Got Shrimp & Grits? Well, I’m not intentionally dragging this out! Trying to figure out how much of a 14 day trip to write and how to write it took a little time. And how much are y’all even interested in hearing? I think pouring over the map and seeking to find things to see and do helps me to enjoy a trip more. I know more what to expect. Carol Y. and Beatrice K. were with us 10 and 6 days, respectively. Maine was the first state we spent any amount of time in so that will be the first topic I will cover. The state of Maine is quite large and we only stayed along the coast so I really don’t know what the majority of the state looks like. 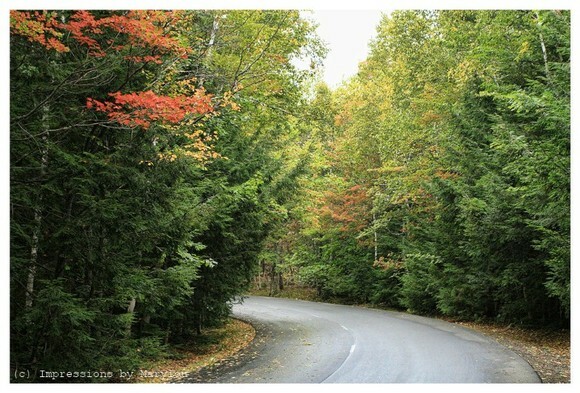 The pictures that I’ve seen of the northern part of the state remind me a lot of Northwestern Ontario. We loved the coast with it’s gazillion harbors. I wonder how many millions (or thousands of boats are in the N.E. states?!? We stayed on the coast and I will cover lodging later. 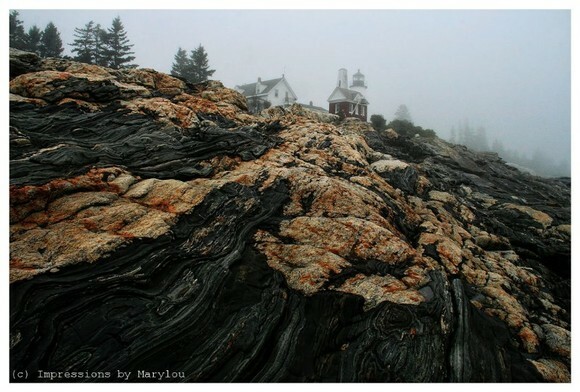 It was overcast/foggy/rainy the two full days we were in Maine. So I have no photos of sparkling emerald green water. The morning we left . . . well, it was bright and sunny. 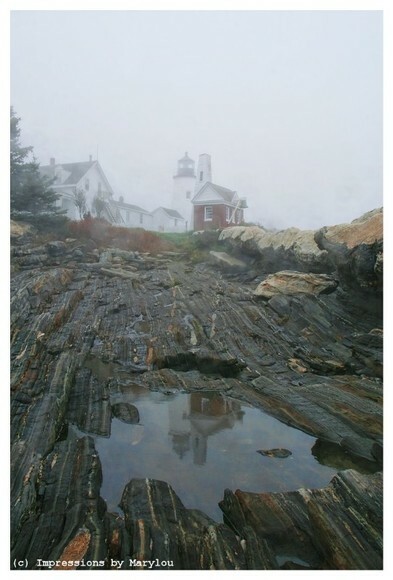 We went to see Pemaquid Point Light, which is one of the more popular lighthouses in the NE. The gentleman at the booth collecting the entrance fee really cracked us up and made our day! I love when people love the job they’re doing and make your day by doing it well and with a sense of humor. 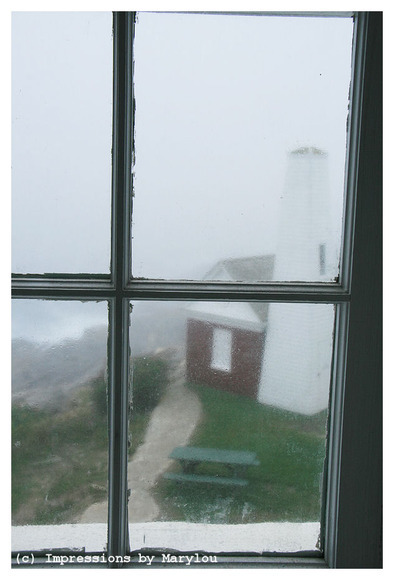 The fog was so thick around the lighthouse that it was hard to imagine the ocean stretched out just out of our sight. By the time we were ready to leave, it was raining. 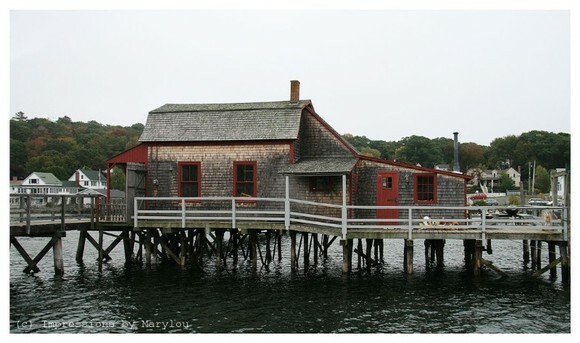 The keeper’s house at Pemaquid Point is a museum and it had interesting info on lighthouses as well as fishing and lobstering. 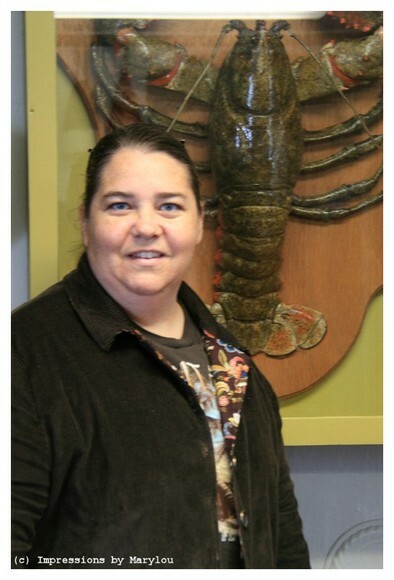 There was a mounted lobster that weighed in at 28 lbs. 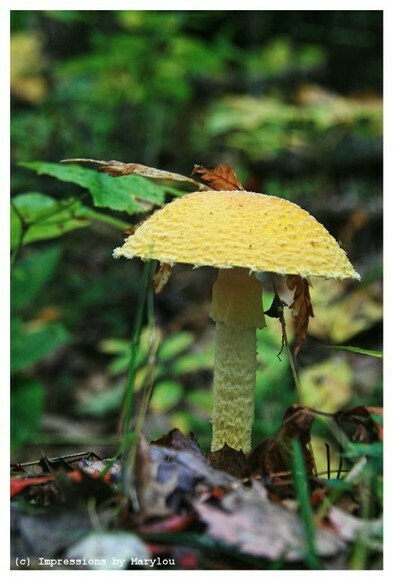 (below) and in a photo of a 45 lb. lobster caught 70+ years ago. A sea captain’s log book was available to leaf through. Some interesting stories we picked up here were: 1. Once a ship carrying coal wrecked into the rocks by the lighthouse. The crew survived and the locals were able to salvage enough coal to heat their homes for the winter. 2. A young man came across from Europe to start a new life, hoping to send soon for his wife to join him. They encountered terrible storms and barely survived the crossing. His letters telling of this story to his wife scared her so bad she refused to make the journey to join him. He was too traumatized to cross the ocean again and so they spent the rest of their lives apart. 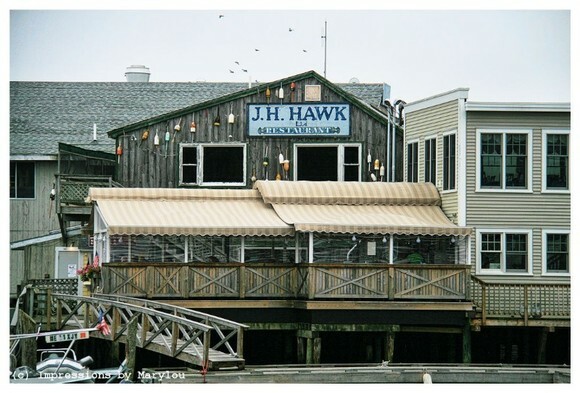 We went to Boothbay Harbor to eat lunch and spend an hour or two relaxing. This is typically a fairly active tourist spot but it was next-to-empty this day. The weather was foggy plus it was Thursday, which probably caused the absence of people. Can’t say I minded it, though. I’d rather have it quiet than to elbow through crowds. We grabbed some lunch from a restaurant and ate by the water. 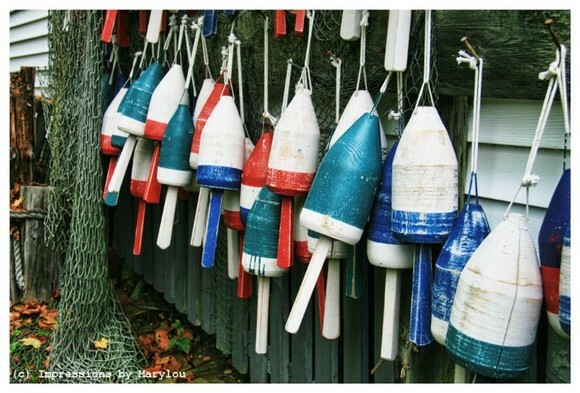 The “lobstah” floats are color coded per owner. 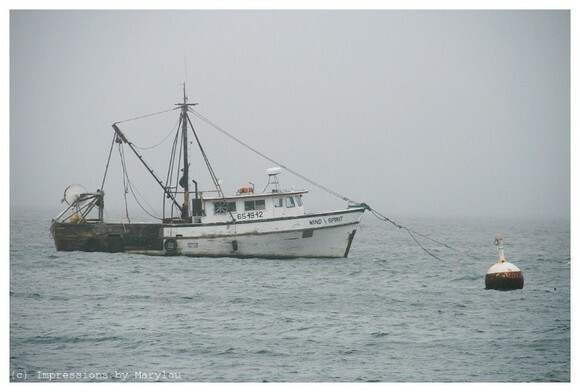 There are places you can go out with lobster boats and see them check their traps. In the next picture below you can see a walkway coming from the left, that gives people access to the other side of the harbor. Next stop was an hour or so drive down to Portland. On our way we were following GPS which took some shortcuts through beautiful back roads. In Portland there is a boat tour of Casco Bay that we heard is really good but we didn’t have time to take it. Gotta save something for next time!! Portland Head Light was another lighthouse we made a special effort to see. 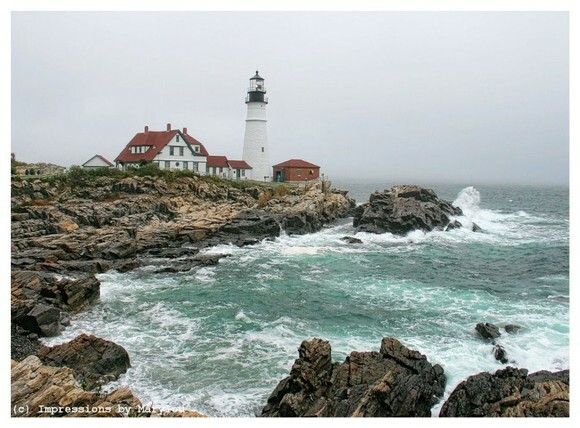 There are more than 60 lighthouses in Maine alone and while we didn’t plan to hit many of them, we had picked out a few that were easy to get to, as well as very pretty. 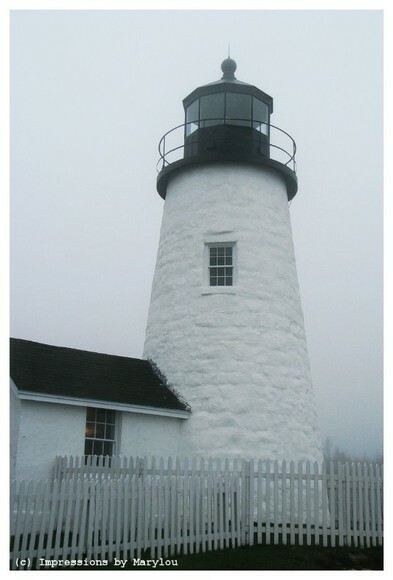 Built in 1791 and commissioned by George Washington, this is Maine’s oldest light. This one is really very beautiful! And the sea really is very emerald! We stopped in at the L.L. Bean flagship store in Freeport that is HUGE! It is open 24/7/365.They have several different buildings. One has home furnishings, then there’s the camping section, the clothing building, the hunting section, the furniture section …. You get the picture. 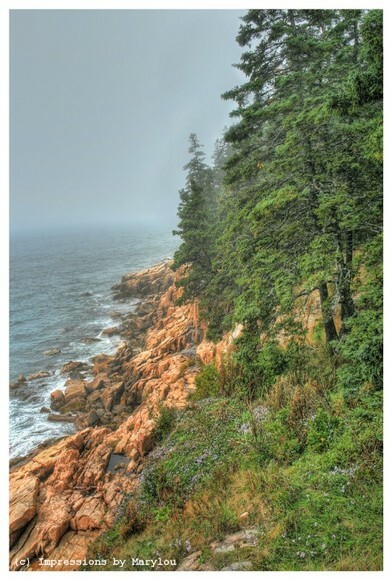 On Friday we drove to Acadia National Park, again in fog/rain. The park was not empty but closer to empty than full. 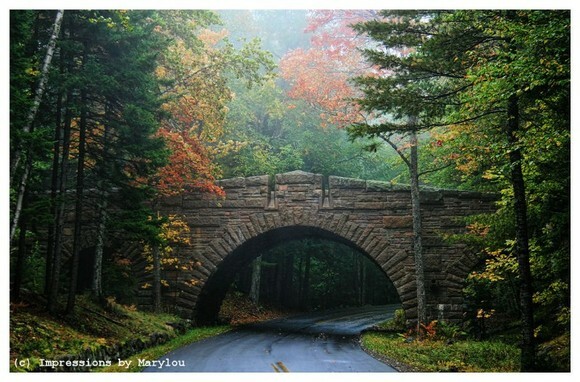 I’ve heard that it can be full of tourists, particularly Bar Harbor. Again, the weather, while being less than exciting, probably kept many people from coming that day, especially since the next day was supposed to be clear and sunny again. We drove around Park Loop Road, stopping at Sand Beach. There was one brave (?) soul out there attempting to do some surfing but he would get a 3-second ride and act like it was the greatest thing. The sand beach (off camera to the left) has very coarse sand. It is also a popular place to swim in the summer even though the water temps stays cold. 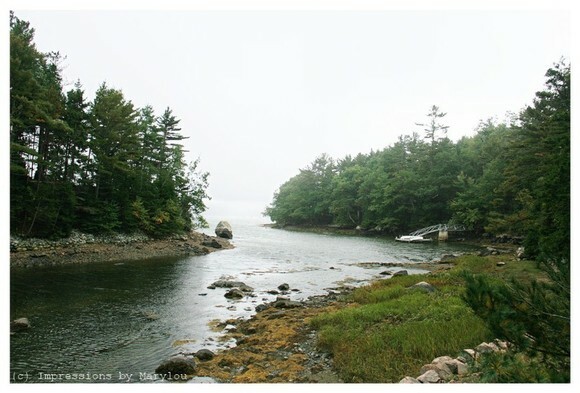 Most of Maine’s coastline is rocky so they have to take advantage of the sand beach. It was near low tide so Thunder Hole wasn’t thundering. It was only crashing. 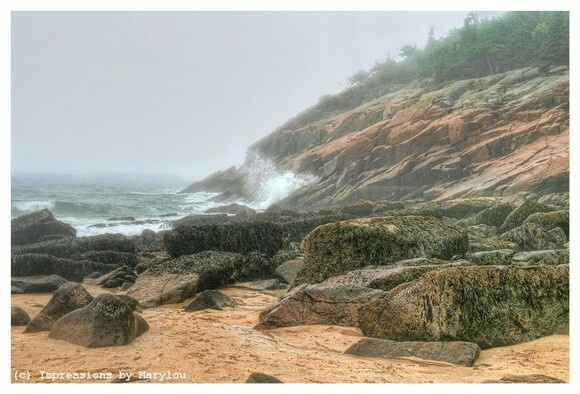 Thunder Hole is a place between rocks and when it is high tide, the water roars in and splashes very high. The man at the visitor’s center told us it’s not worth re-arranging our schedule to make sure we’re there in high tide, unless there’s a storm involved. We ate lunch at Northeast Harbor, which was quiet. Each little town had shops but shopping was not on our agenda. We had a 2.5 hour trip each way from our lodging to Acadia. Why didn’t we just stay there? Well, we had a limited time in Maine and it really was nice to stay at the same place for 3 nights. 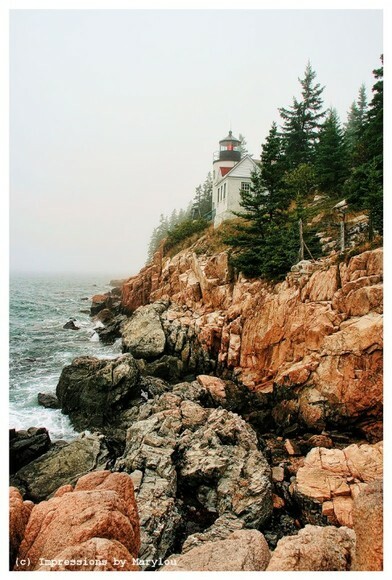 We pressed on to see the Bass Harbor Head Light. Passed much beautiful scenery. Seriously, I don’t think I would ever get sick of being near water. And Acadia really does take a while to drive around. The Bass Harbor Light is being maintained by a Coast Guard family and they had a tiny yard that was fenced off. We could walk up to the side of the lighthouse. The area in front of the lighthouse is a cliff. The best shot you can get of the front of the lighthouse is this (unless you go by in a boat).You have to climb over large rocks to even get to this. At first I didn’t think I had enough goat in me to try it but between hard up to get a better picture, and the rocks seeming more stable than they first looked, I did hop on out. 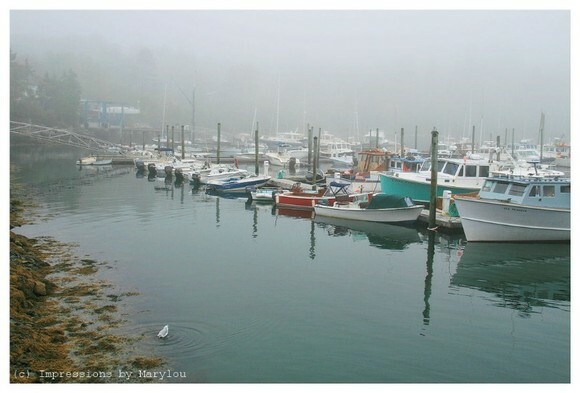 We did stop at Bar Harbor for a bit, and it was mostly deserted. I took a snooze while the others stopped at a few shops and got some bargains. There were several cruise ships in the harbor and we ran into the (mostly) seniors several times around the island. 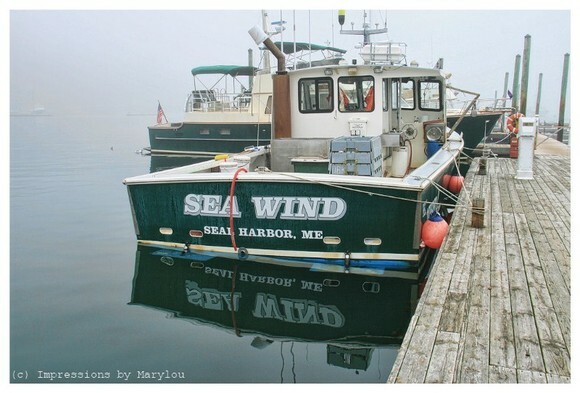 In fact, we were encouraged to go to Northeast Harbor for lunch if we wanted a quieter place but 2 busloads of tourists showed up for a “lobstah” bake at the same restaurant we were at. 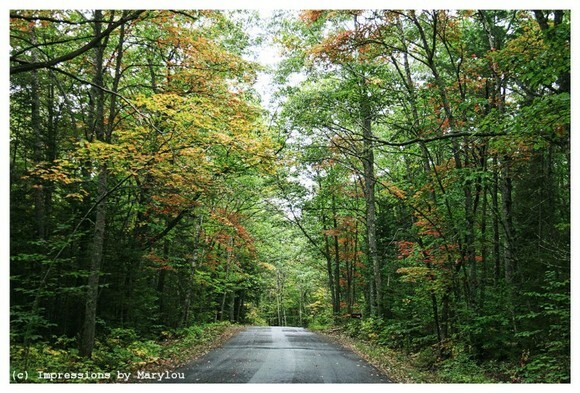 It really is hard to say what our impression of Acadia’s beauty was. It’s as if the whole day passed in a fog. Har har. We know it’s beautiful we just don’t know the extent of it. We’ll leave the further exploration of it’s beauty for next time as well. And while I sound like I’m complaining about the weather, I am not. As far as taking photos, it’s better to have fog than harsh sunlight. 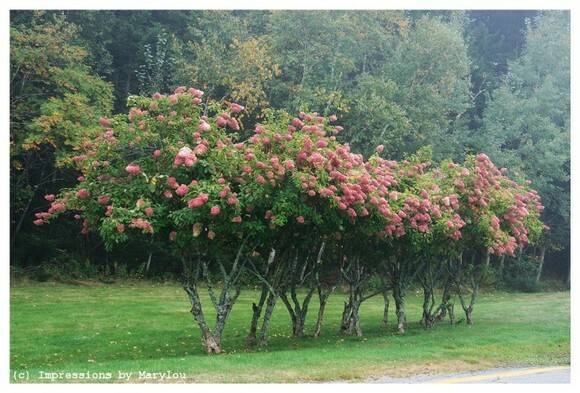 All over the New England states we saw these Hydrangea “trees” that were intriguing. We asked someone about them and they said the blooms are usually pink and then at the end of the season they turn this taupe color. It’s Wednesday evening, September 22, approximately 6 days and 10 hours before our flight is scheduled to leave from the still warm south to the nippy north. I breathe a sigh of relief as the last of the lodging arrangements have been finalized. 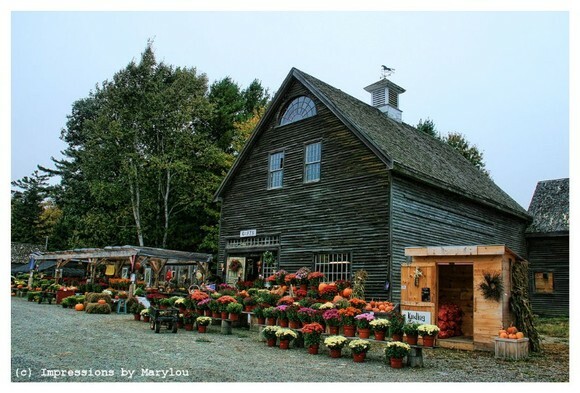 Fall in New England is a very busy time for tourism, so we’re told, and lodging, especially in rural areas, should be made in advance. How does a person decide what to see an do in an area this large when she’s never been there before? Thankfully there is such a thing as the WWW and search engines. AAA’s Trip Tiks is also a very helpful tool for finding information on specific areas. Still, 14 days is only enough time to scratch the surface, search engines or no search engines. 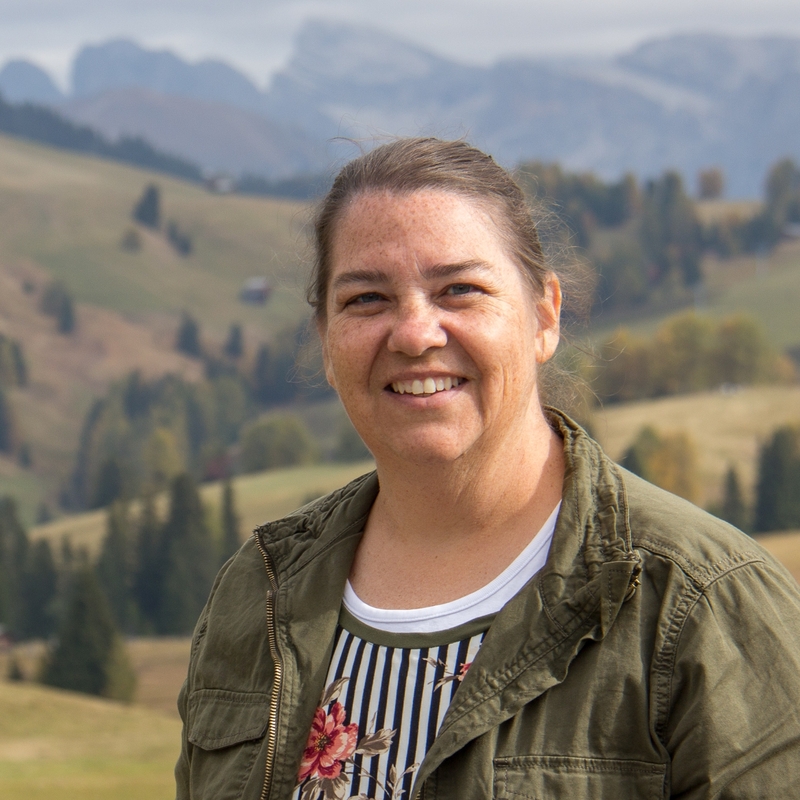 We have 2 other ladies joining my sister and both are in ministry of sorts and are limited to the number of days they can be gone so we have 6 days with 4 ladies, 10 days with 3 of us, and the last 4 days just my sister and I. 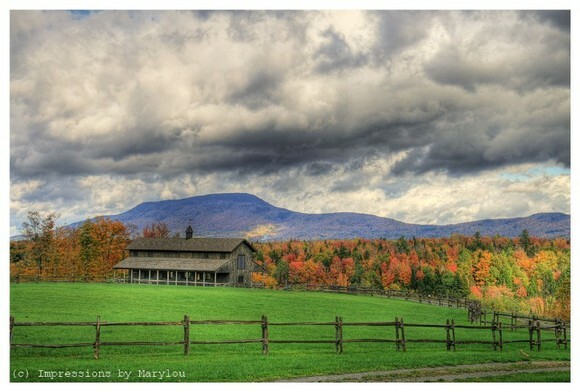 We had thoughts of a quaint inn or B&B in some delightful setting but fall foliage season is peak tourist season so prices were at their highest. We usually avoid paying top prices for lodging so why do it now? We even resorted to using Priceline thrice and had good success, assuming the 3 star hotels we got aren’t bombs. We have to be in Boston 4 times to keep flight schedules so that is where 2 of our Priceline deals came in. Downtown Boston prices seemed to be out of our budget, plus staying on the west side of Boston gives us a great chance to see other parts of Massachusetts and Connecticut. Our route looks like we have serious ADD but it works for us. I wouldn’t recommend such a trip itinerary but for our schedule it works great. We can’t see all of N. E. anyway! Eighteen hours until flight time and I feel like something the cat dragged through the mud and then left out overnight. A cold has attacked me and I’m slightly frustrated. This is not how I imagined starting a 2-week trip-of-a-lifetime. Praying for better days ahead. Because there is no one to fill in for me at the office I am doing the best I can to get things caught up for the next two weeks so my boss can at least make a deposit a job check and distribute checks for employees and subcontractors. My head is screaming for my bed but it has to ignored. Thank God that I woke up on Wednesday for our 7 am flight feeling much, much better!!!! Let the trip begin! !